During pregnancy your muscles, joints and ligaments experience significant change which can affect the whole body. Pre and postnatal physiotherapy helps women manage these changes and teaches them skills and techniques such as positioning, rhythmic movement, massage, relaxation and breathing exercises which can help reduce or prevent pregnancy related issues. Centenary Hospital for Women and Children offer a number of pre and post natal exercise and physiotherapy programs for all women who are birthing at the hospital. Bub & Me Physiotherapy is a Canberra-based business offering prenatal and postnatal exercise classes run by physiotherapists. They offer tailored exercise programs to help you to stay strong, fit and well during your pregnancy and after the birth of your child. her physio offers a specialised service for women of all ages including during pregnancy and after the birth of your baby. Their physiotherapists understand the importance of good health and uses evidence-based practice and management strategies to help ensure the best outcomes. her physio advises and educates women on the changes to expect in their bodies during the different stages of pregnancy. They also provide pelvic floor assessment and management during pregnancy – when your pelvic floor is most vulnerable. Sport & Spinal Physio assists women from Gungahlin, Canberra City, and the wider Canberra community with a range of common pre and post natal problems. 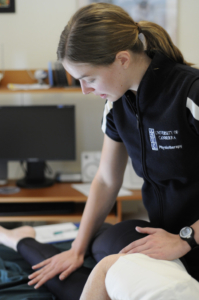 Southside Physiotherapy & Sports Injury Centre physiotherapists are qualified to assist you with a wide range of Women’s Health conditions such as pelvic pain, postnatal care, incontinence, urgency and prolapse. Back in Strength we have experienced and sensitive female physiotherapists who are passionate about caring for women’s health issues. Capital Clinic Physiotherapy has a complete range of Women’s Health services that can help you. The team of Physiotherapists who specialise in women’s health related issues such as pelvic floor function and bladder & bowel control, understand the impact these conditions have on a woman’s health and wellbeing. Accelerate Physiotherapy offer a range of women’s health physiotherapy services. Anna Scammell, their women’s health physiotherapist, has over ten years experience specialising in ante and post-natal women’s issues including treating pregnant women with back & pelvic pain, assisting with recovery after childbirth and women with pelvic floor dysfunction, prolapse or incontinence at any age.